I have become quite obsessed with these goji berry and coconut raw bars. I take them with me everywhere. Yep, that's right, EVERYWHERE! I make them beforehand and bring them with me on almost every trip! With all raw ingredients, they store well and don't have to be refrigerated! Plus, they taste so yummy and are packed full of healthy antioxidants! I am also one of those lucky people that tends to be quite allergic to certain foods like nuts, dairy, soy, and eggs. These allergies makes my breakfast options rather limited. So, in fairness, most of my excitement over these raw bars comes from the simple fact that I can actually eat them. Great taste and no allergic reaction... Win. Win. For me. Parchment Paper - not an ingredient, but an important item! The above proportions all depend on personal preference and on how many bars you are looking to make. In general, I start with two boxes of dates (24 ounces) and slowly mix in the granola to my liking. And, almost always, I have left over granola. I suppose, you can use store bought granola and just simply toast it yourself, or buy pre-roasted. But, my preference for quality control and consistency with this recipe, is to make my own! 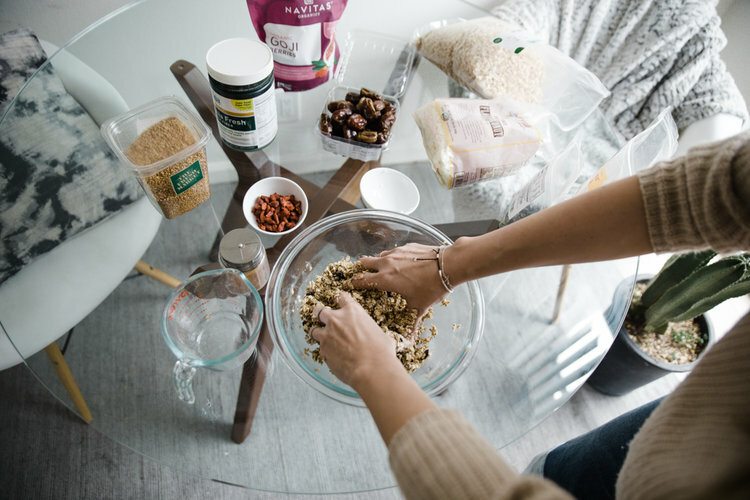 The recipe for my go-to granola can be found here! I highly recommend this recipe for these raw bars! Once the granola is ready, simply slice the dates down the center and remove the pits. I find it easier to mix with the dates pre-chopped into smaller pieces. Step 04: Mix. Mix. Mix. Now, it's time to mix the granola with the dates! This is the messiest part of the process. I have tried several methods of doing this and quite frankly, I think using your hands is the only thing that really works well. You want to make sure that no chunks of dates are left and that the granola is well coated. Slowly add in granola to ensure the mixture is just right. Don't add in too much granola from the start, because there is no going back! In my experience, more dates equates to bars that will stick and stay together better. Too much granola can cause the bars to be flaky and fall apart. This is also when you will want to add goji berries if you aren't using my granola recipe that already has them mixed in. And, I always add more cinnamon and a little honey because I'm obsessed. Taste the mixture to make sure it is sweet and flavorful enough for you and play with adding ingredients to ensure it is what you want! Be mindful that the dates will add a lot of sweetness. Place parchment paper into a container. Anything container-wise will work. I think it works best to choose something that has a top so you can easily store the bars once cut! Lay out the mixture into the container. It is important to note that you want it to be even. If the edges are too thin for example, then the bars won't stay together well in that area. Personally, I prefer toasted coconut to bring out the oils. My husband likes coconut better without the toasting. Either way, add a decent amount of flakes. I usually try to press them into the raw bars because they will fall off. Lastly, place the container into the freezer for a few hours. This helps everything to harden particularly if your granola was fresh out of the oven. My granola has coconut oil in it that thickens up to help keep everything together! Step 09: Cut Them Up! More or less, this is what your bars should look like!!! At this point, they should be ready to enjoy. I usually keep mine in the fridge, but since all the ingredients are raw, it is up to you how you want to store them. Either way, these babies are delicious!!! Enjoy!!! And, Don't forget to take these babies with you on your next adventure!! !